As golfers already know, playing a round is both mentally and physically challenging. Although golf is considered a leisurely sport, it requires coordination, strategy and strength. 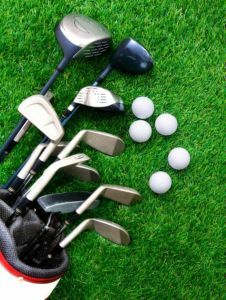 Read on to be reminded of the many benefits of golf; and the next time anyone raises an eyebrow at your time spent on the course, you can assure them it’s all for a good cause! Whenever possible, forgo the cart and play on foot to reap the best physical benefits of golf. Walking a round of 18 holes can be equivalent to a length of three to five miles. Carrying your own clubs will only increase your exercise output even more. It’s estimated that a male golfer burns around 2,500 calories during an 18-hole round and females burn approximately 1,500. That’s a lot! Even if you drive a cart instead of walking, the constant swinging, pivoting, kneeling and crouching throughout the game increases your heart rate which not only reduces the chance of heart disease and decreases levels of “bad” cholesterol, your risk of stroke and diabetes are lessened. Golfing offers just enough physical activity to keep your muscles engaged and blood pumping. With regular physical activity comes better sleep. After a tiring round, you’ll find that you will sleep deeper and longer – which aids in cell regeneration, tissue repair and overall longevity. Hardly enough can be said about the benefits that golf brings for your state-of-mind. Simply being outdoors and in nature can reduce stress and help relieve anxiety. Further, the vitamin D exposure from spending hours in the sun is known to reduce the risk of depression. The cadence of the golf game allows for plenty of socializing between play, which is key for fostering relationships. The social aspect of golf and the interaction of others play a role in elevating your overall mood, even hours after your game is finished. In fact, the pleasure that comes from socializing and the exercise itself releases endorphins, helping to make you feel happy and relaxed. The mental faculty involved with strategizing for your game, as well as the necessary hand-eye coordination you need, keeps your brain activity high which is known to boost your mind’s logical functioning and can stave off dementia or Alzheimer’s. So, go ahead and get on out there. You’ll get your blood pumping and your endorphins kicking. Maybe we’ll see you on the links!